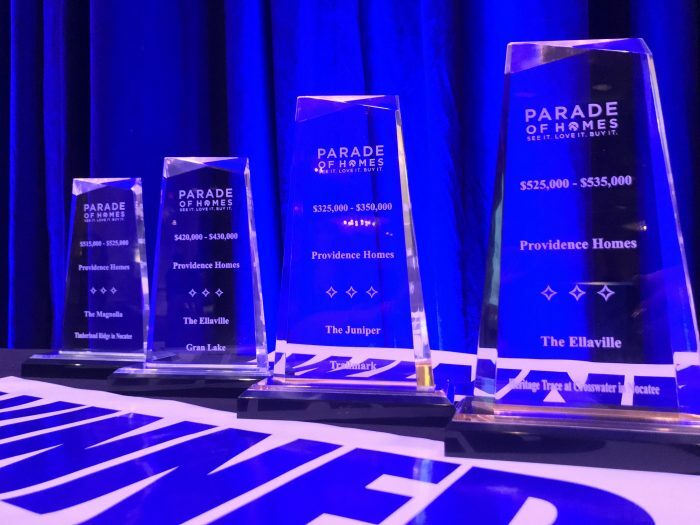 We’re proud to announce that four of our model homes were recognized by the Northeast Florida Builders Association at the 2018 Parade of Homes banquet. The winning model homes were The Magnolia Model at Timberland Ridge and The Ellaville Model at Heritage Trace in Nocatee, The Juniper Model at TrailMark and The Ellaville Model in Gran Lake. The Magnolia Model at 110 Pine Manor Drive Jacksonville, FL 32081 (Nocatee) features 3,049 sq. ft 4 bedrooms, 4 baths, a 3-car garage. The Magnolia features Tray Ceilings with Crown Molding in Main Living areas, as well as a Dining Room, Family Room, Gourmet Kitchen/Café, Study, Bonus Room with Bath, Covered Patio, and 2-Car Garage. The Magnolia received a HERS (Home Energy Rating System) Index Rating of 55 with an estimated $111.91 per month total electric bill rating for 3,143 sqft of living space – estimated annual savings is $843.00! The Ellaville Model at 70 Village Grande Drive in Heritage Trace Ponte Vedra, FL 32081 (Nocatee) offers 3,116 sq. ft., with 5 bedrooms, 4 baths, and a 2- car garage and features hardwood flooring in Main Living areas, detailed molding throughout, a must see Laundry Room and more. The Ellaville received a HERS Index Rating of 56 with an estimated $123.33 per month total electric bill rating for 3,116 sqft of living space – estimated annual savings is $849.00! The Juniper Model at 118 Tabby Lake Avenue St Augustine, FL 32092 features 2,559 sqft with 3 bedrooms, 2.5 baths, and a 2-car garage overlooking lake and TrailMark amenity center. The Juniper features a Living Room, Dining Room with a Bay window, Family Room, and Gourmet Kitchen, Pocket Office, Covered Patio and 2-car garage. Wait until you see the upstairs Loft and extended Owners Suite with Escape Spa Bath! The Juniper received a HERS Index Rating of 55 with an estimated $104.16 per month total electric bill rating for 2,559 sqft of living space – estimated annual savings is $754.00! The Ellaville Model, located at 89 Evenshade Way, St Augustine, FL 32092 is a spacious 5 bedrooms, 4 bath 3,116 sq. ft. home. The Ellaville features Tray Ceilings with Crown Molding & Plank Board Trim in Main Living areas, as well as a Study, Family Room, Gourmet Kitchen/Café, Pocket Office, Bonus Room with Bath, Covered Patio, and 2-Car Garage. The Ellaville received a HERS Index Rating of 52 with an estimated $115.33 per month total electric bill rating for 3,116 sq. ft. of living space – estimated annual savings is $933.00! All Providence Homes are 100% ENERGY STAR® Certified with conditioned attics using spray foam insulation and 16 SEER HVAC systems. “As-Built” HERS® Index Ratings are available at each model. The 2018 Northeast Florida Builders Association Parade of Homes was one of the largest ever, with more than 90 model home entries throughout Northeast Florida. All four winning Providence Homes model homes are open daily Tuesday thru Saturday from 10AM-6PM and Sunday & Monday from 12-6PM. Call 904-337-5236 for details or additional information.